The Jubilee Year called by Pope Francis begins in less than six weeks, and, despite tedious delays, the city fathers are forging ahead with their preparations for Rome, from repairing sidewalks to providing first aid centers. 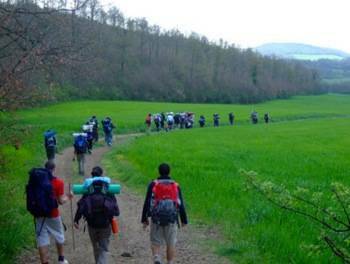 A leitmotif is the revival of interest in the Francigena, the centuries-old route pilgrims walked to Rome from North Europe. The Jubilee Year called by Pope Francis begins in less than six weeks, and, despite tedious delays, the Roman city fathers are forging ahead with their preparations. Expecting literally millions of visitors after the year opens Dec.8, city hall is repairing the stone balustrades on the Tiber River bridges, tidying up public parks and public toilets, laying a few new tram rails, setting up medical facilities, repairing sidewalks and so on, for another dozen projects. Particularly important among these is the creation of designated pilgrim walks to Rome's historic churches. An interesting leitmotif of the preparations is the revival of interest in the traditional pilgrims' routes that lead into Rome from North Europe. Speaking to the press last Saturday, Dario Franceschini, Italy's Minister for Culture and Tourism, announced that, "The year 2016 is now formally designated as the Year of National Pilgrimage Walking." Indeed, a perhaps surprising number will arrive in the same way medieval pilgrims did: on foot. As Franceschini went on to say, Italy offers some 4,100 miles of walks, north and south, for "spiritual pilgrimages," but which are also suitable for the growing number of those interested in slow tourism as a way to enjoy Italy's natural world and rich culture. Earlier Franceschini had told a reporter from the Catholic daily Avvenire that, "The extraordinary Jubilee Year called by Pope Francis brings many for prayer and faith, but it can also can contribute to making Italy a waystation toward a more serene future, through knowledge of its cultural heritage." Visitors who usually flock to the main centers of attraction, like Rome, Florence and Venice, are now discovering the less well-known places. This is not merely about conventional tourism or its financial benefits, he went on to say. "These are the places," said Franceschini, "which vaunt our huge wealth of history and culture -- the churches, sanctuaries and ancient 'borghi' [town centers], plus the extraordinary natural landscape of the entire Italian peninsula." Foremost in Italy among the newly popular walking routes, and now beginning to rival the Camino de Santiago de Compostela in Spain, which attracts over 200,000 people a year, is the medieval Via Francigena, so named for its being the road pilgrims walked to Rome from France (though it actually began in Canterbury, England). Some years back this reporter was surprised to come upon thirty-some pilgrims from northern Italy walking toward Rome on a road near Sutri, a famous stop on the Via Francigena route. Aged from ten to perhaps seventy, they were singing and dragging along a huge wooden cross. Today such a sight would be less surprising. Sutri, first Etruscan and then a Roman town, stands on a high plateau overlooking the narrows of a canyon through which passes the ancient Via Cassia. Under the Romans the town was a fortress to block marauders before they could attack Rome itself, 41 miles distant. 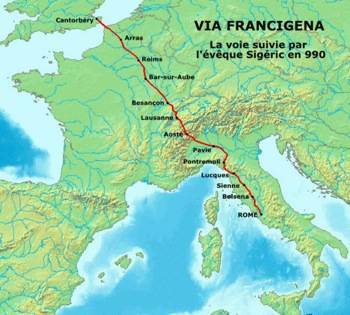 During the Middle Ages it became a major stop-over for Francigena pilgrims. Besides providing food and a bed, Sutri citizens specialized in making and mending pilgrims' worn-out leather shoes. Sutri shoemakers still take orders for hand-made footwear, particularly riding boots. The hilltop town still is a Francigena stop today, and it is not unusual to see pilgrims -- alone or on foot -- striding through the main square of the town, carrying a backpack and the traditional pilgrim's staff. A certain number wear lederhosen, showing that they have walked from Germany. Another day I met and spoke with a group of French women, who were not walking the entire Francigena, but stretches of it as they approached Rome. 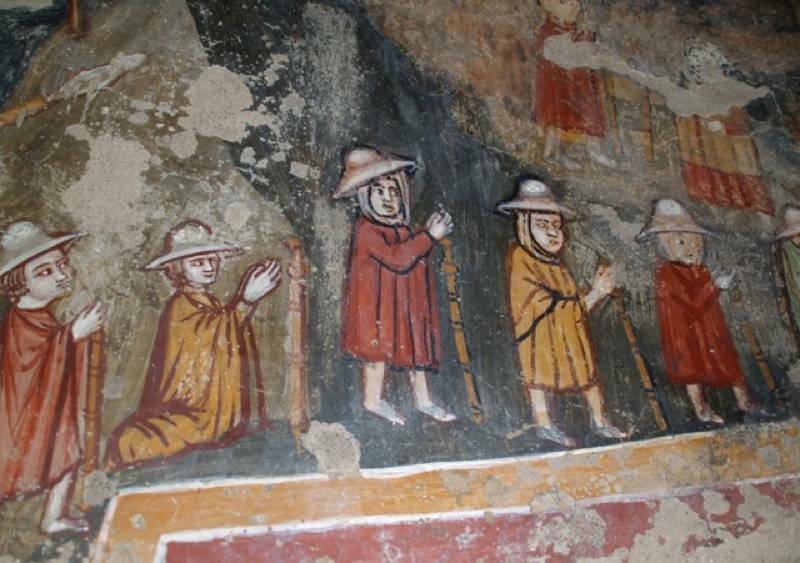 What makes this sight so fascinating is that it recalls the 13th century painted fresco of pilgrims still visible on a wall inside Sutri's Mithraic temple, carved deep into a rock wall but converted to a Christian place of worship. At Saturday's press conference Minister Franceschini was flanked by Mons. Liberio Andreatta, deputy chief of the Opera Romana Pellegrinaggi (the Rome Pilgrim office of the Vicariate of Rome), and Giovanni Lolli, coordinator for tourism in the Italian regions. For months Italian church officials, together with representatives of publishing houses, have been meeting with Franceschini to plan the Italian contribution to the Jubilee Year. Among their suggestions is that, besides Rome, pilgrims consider calling at sanctuaries at Assisi in Umbria, dedicated to St. Francis; the medieval Marian shrine of Loreto in the Marches, dating from the time of the Crusades; and, in the Puglie region, the 11th century Monte Sant'Angelo, visited by Pope John Paul II in 1987. 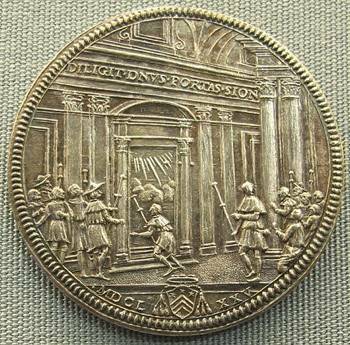 The tradition of Jubilee Years dates from the year 1300.